How satisfying it can be to harvest aromatic, fresh herbs from pots or gardens while preparing food. 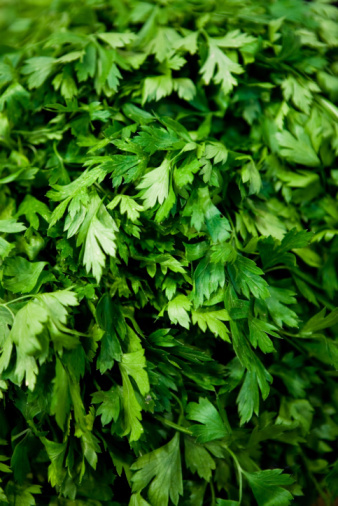 Herbs perfume the kitchen, stimulate appetites and add their complex flavors to dishes. When planning an herb garden, it's helpful to know how long it will take to harvest the herbs that will be grown. That knowledge will help you allocate garden space and estimate harvest timelines. Annual herbs grow quickly, sometimes outstripping their allotted space. 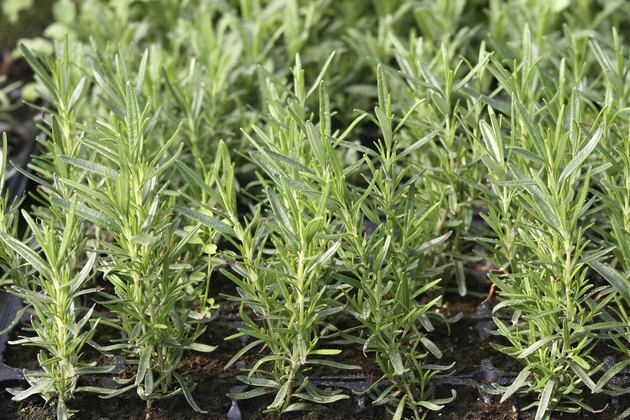 Perennial herbs take longer to reach sustainable harvest. 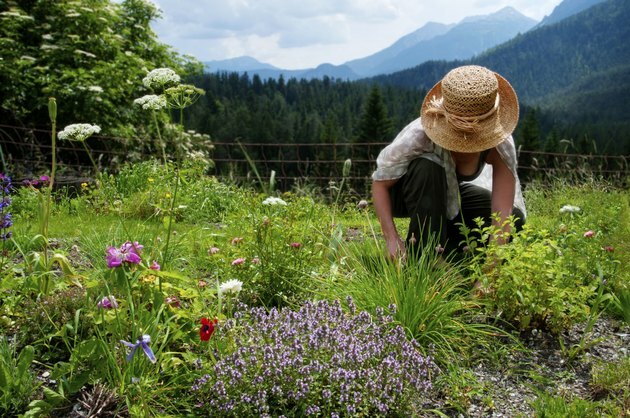 A woman picks herbs from her garden. A close-up of sage growing in a garden. 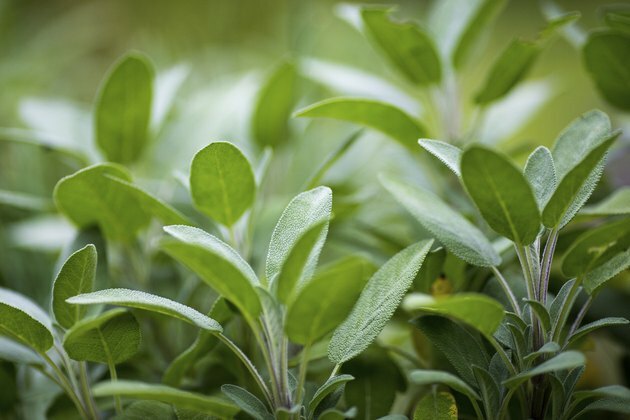 Although all herbs will grow from seeds, shrubby perennial herbs often are slow to germinate and can take a couple of years to reach a size appropriate for harvest and longer to produce good yields. If you want quicker results, then root a cutting; usually, the resulting plant will grow large enough so that it can be added to recipes by the next season. Perennial herbs are an investment that can last years. So give them enough room to grow. For short-lived annuals, which last only one season and include cilantro (Coriandrum sativum) and dill (Anethum graveolens), seeds are the only way to go. A young basil plant grows in a planter. Some herbs germinate very quickly and take right off. 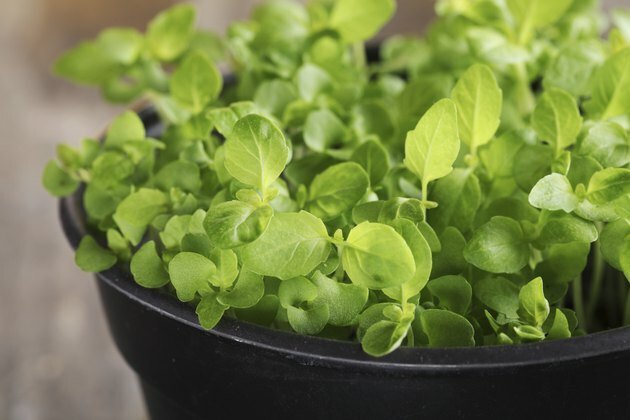 When you plant basil (Ocimum basilicum), look for seedlings after just four days. Begin harvesting basil when the plants are 6 to 8 inches tall. Usually treated as an annual, basil is a tender perennial that is hardy in U.S. Department of Agriculture plant hardiness zones 9 through 11. 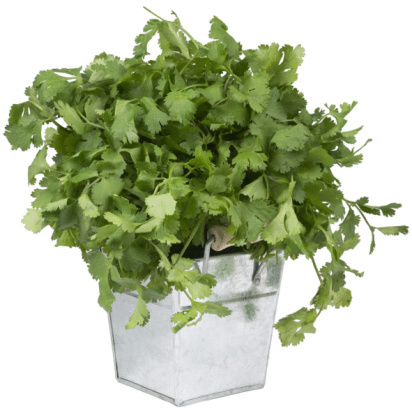 Cilantro is also a quick starter, coming up within seven to 10 days after its seeds are sown. Dill sprouts after one or two weeks, and the cultivar "Long Island Mammoth" reaches 4 feet tall in about two months. Spearmint (Mentha spicata) germinates in seven to 14 days, and once started can become invasive. It is hardy in USDA zones 3 through 7. 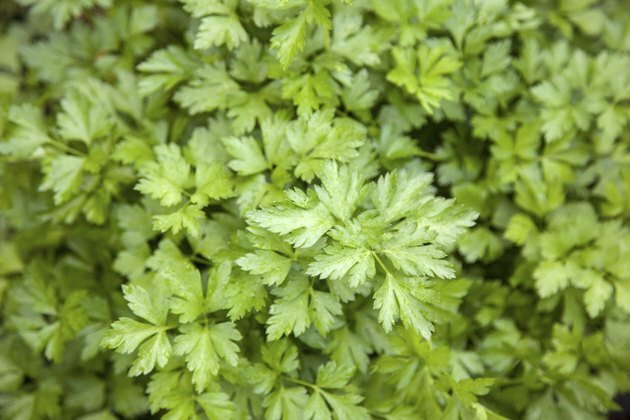 An overhead view of parsley growing in a garden. A few herbs have slow seed germination rates, but their seedlings grow more quickly once they are established. So don't throw away the seed pot of parsley (Petroselinum crispum) after a few weeks because parsley takes 14 to 60 days to germinate. Once its seedlings have a few sets of true leaves, they quickly grow to yield abundant leaves for soups and garnish. Parsley is biennial, living two years, but it's usually treated as an annual in USDA zones 2 through 11. Another example of a plant that begins slowly then grows fast is the perennial lemon bergamot (Monarda citriodora). Hardy in USDA zones 5 through 9, it produces seeds that germinate in 10 to 40 days at 68 degrees Fahrenheit. The short, purple-flowered plants quickly grow to blooming size and can naturalize in favorable areas. Young rosemary plants growing in a greenhouse. Plants in the mint family (Lamiaceae) are notorious for slow germination, and these plants are better started as rooted cuttings. One example is rosemary (Rosmarinus officinalis), which germinates in 10 to 42 days and is hardy in USDA zones 8 through 10. Another example is English thyme (Thymus vulgaris); its tiny seeds sprout within 14 to 28 days and the seedlings grow slowly in USDA zones 5 through 9. One of the slowest herbs to grow, both in terms of germination and plant growth rate, is sweet bay, also called bay laurel (Laurus nobilis). Its seeds often rot before they sprout, and its cuttings taking six to nine months to root. Hardy in USDA zones 8 through 10, the evergreen bay laurel eventually becomes a large bush or small tree.